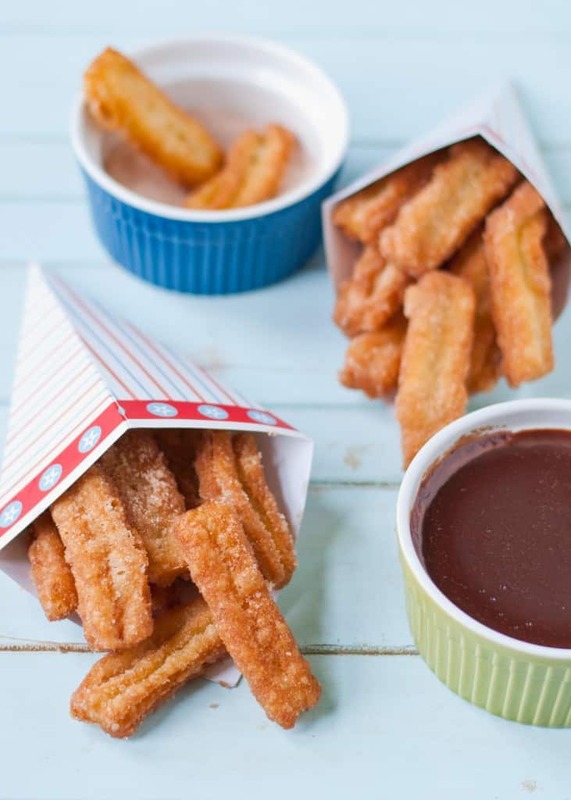 Crispy, golden churros rolled in cinnamon and sugar and dunked in a creamy dark chocolate sauce. Today we’re celebrating #SundaySupper’s 2nd Birthday! It’s hard to believe what started as a simple vision to bring families back to their dinner tables has turned into a weekly movement including bloggers from all over the world. Isabel of Family Foodie started #SundaySupper two years ago, and her vision and passion have helped it grow into what it is today. Interestingly enough, it’s also been almost exactly 1 year since I joined #SundaySupper with this Retro-Inspired Tater Tot Casserole. I knew something was different about this group as soon as I woke up that first Sunday morning. My blog was still very small at the time, and I had only recently switched over to a new site. I remember laying in bed reading my emails (bad habit, I know) and being thrilled to find several people had already commented on my blog at 8 AM. I knew right then this was a very special group of people. Since that first Sunday, I’ve received so much support and encouragement from this talented group of bloggers. This is a group that sticks together, champions each other, and motivates one another to improve our craft. I couldn’t be more excited to share this birthday celebration with such a precious group of people. This week’s frozen temperatures gave me a few extra days off work and More time + Being locked in the house + A birthday to celebrate could only equal one thing: Homemade Churros. 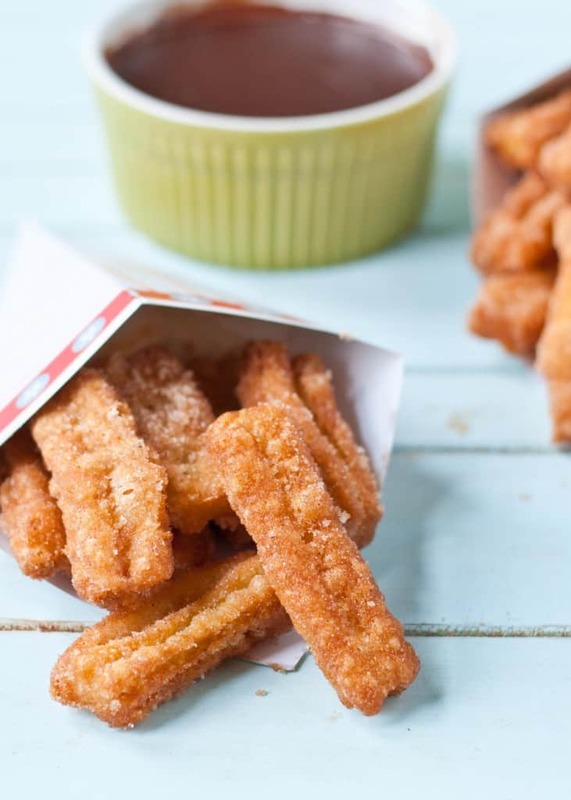 If your only experience with churros has been the lukewarm sticks-in-a-paper-sleeve you get at Taco Bell, please erase that from your memory. These Churros are worlds better than those. Each bite yields first the sweet cinnamon spice, then the crispy dough, then the melt in your mouth tender center. Served piping hot from the fryer, the Mr. deemed these “dangerously good.” And indeed they were. I ate so many of them I had to skip lunch (or, rather, I had to accept the fact I had just eaten churros for lunch). While frying these does require an extra time commitment, the dough is actually very easy to make. It can be whipped together in about 15 minutes then fried right away or refrigerated and fried later. I liked splitting the batch and frying just enough for us to eat while they were super hot and fresh. If you want to get the fancy edges, simply place the dough in a piping bag fitted with a large star tip and squeeze out about 4 inches of dough before cutting it off with scissors into the hot oil. I made my churros mini-sized because I think they’re adorable and because I’ve heard mini things don’t have calories. Of course, no birthday celebration would be complete without a little chocolate. 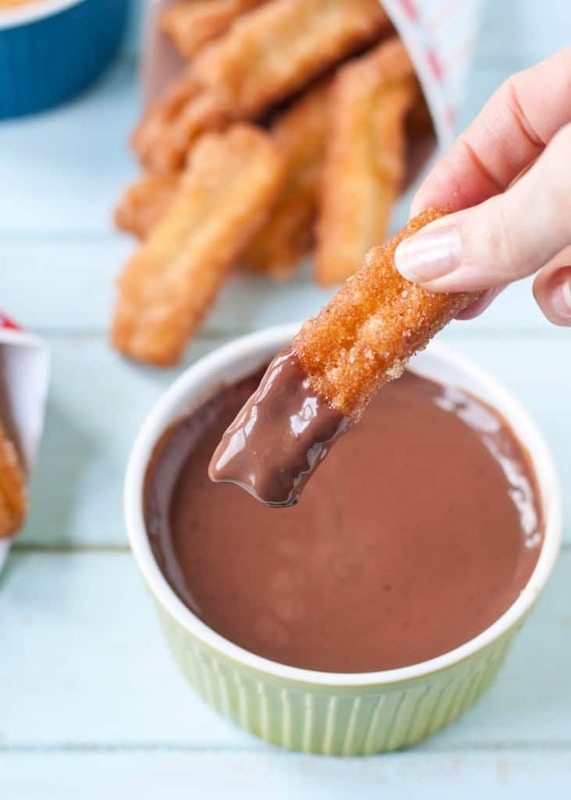 The chocolate sauce for this takes about 10 minutes to make and is the perfect compliment to the churros. Creamy and not-too-sweet, it’ll have you swooning with every bite. Be sure to check out all the other birthday dishes my #SundaySupper friends are sharing today! ***I prefer to use STAR Fine Foods grapeseed oil for frying because it has a neutral flavor and a high smoke point, which means it's less likely to splatter and smoke while you're frying! Combine water, butter, salt, and sugar in a medium sized saucepan and bring to a boil. Using a wooden spoon, stir in the flour then remove from heat. Continue to stir until the mixture begins to adhere to itself and form a ball. Transfer the mixture to the bowl of an electric mixer then beat it for 1 or 2 minutes just to cool it down slightly. With the mixer on slow speed, add the eggs, one at a time, beating until each addition is incorporated. Mixture should be smooth and shiny. Let the dough rest while you preheat the oil. Pour enough oil into the pan to be a least 2 inches high. Heat to 350-375 degrees. Meanwhile, make the chocolate sauce. Heat 1/2 cup of the milk and the chocolate in a small sauce pan until chocolate is melted. Whisk cornstarch into the remaining 1/2 cup of milk. Bring the melted chocolate mixture to a boil then whisk in cornstarch mixture and sugar. Reduce heat to low and simmer, stirring often, until mixture is thickened, about 5 minutes. Remove from heat. Transfer the churro dough to a pastry bag fitted with a large star tip. 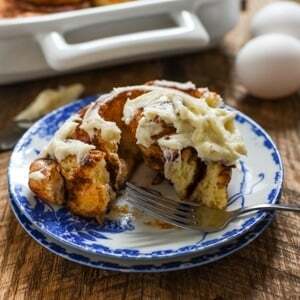 Grab a pair of scissors, a plate or baking pan lined with paper towels, and a bowl with the 1/2 cup of sugar and 1 teaspoon cinnamon whisked together. Over the pot of hot oil, squeeze the churro dough to about 4 inches in length then use the scissors to cut them off into the hot oil. You should be able to cook 3-4 at a time, depending on the size of your pot. Cook churros until golden on both sides, or about 1-2 minutes per side. Place finished churros on the paper towel to drain. When they're just cool enough to handle, roll them in the cinnamon sugar mixture. Serve warm with chocolate sauce. Churros are (one of) my weakness! Great job on this post!! I always think about getting a churro at Costco (they have giant ones) but I never do. I need to make these to satisfy my craving! Gorgeous! Ohhhh churros! The crispy cinnamon sugar goodness is irresistible to me. I have always wanted to make them at home – yours look golden and perfect! I know I got a ton of stuff done when all of Indianapolis shut down with the blizzard and plunging temps! Your churros were a yummy benefit of the polar vortex 🙂 I was so happy to meet you this past year, Courtney! And hope to cross paths with you again soon! Exactly! We have to look on the bright side of the winter weather. At least it produces lots of baked goods! 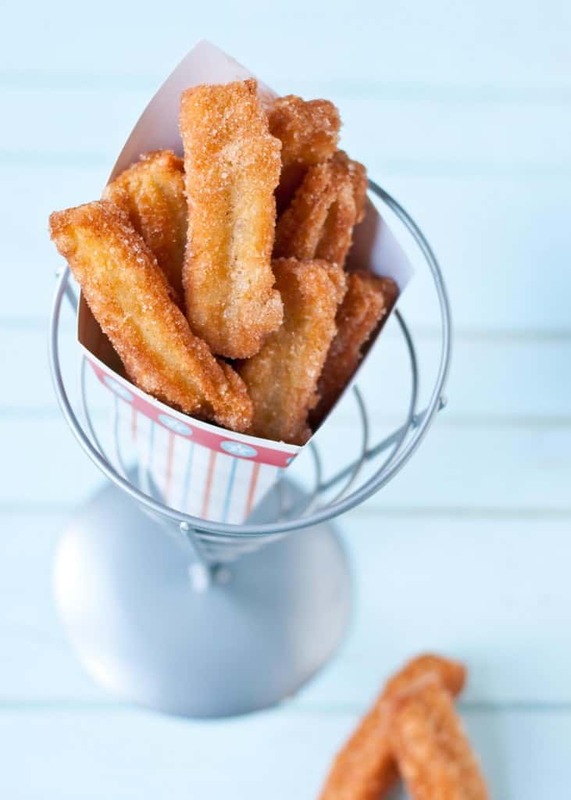 Your churros look absolutely delicious – easily as good as any sold in traditional Spanish cafes! I’ve never been able to enjoy the traditional ones, but I hope these are just as good! So glad you joined the #SundaySupper family! We love your recipes and inspiration and I couldn’t imagine a better dessert for a celebration! Thanks Isabel. It’s been such a pleasure to be a part of this family! Oh man, those churros look amazing. I know what you mean about the early comments! It’s my only day to sleep in a bit and I’m on the west coast so it’s amazing to wake up to awesome comments and people already sharing their day with you. oh I love these Cinnamon Sugar Churros!!! pinning! and cheers to two years! hooray sunday supper! Gotta have chocolate for churros! These look fantastic! You are absolutely right, Courtney! Mini churros or mini anything have no calories =)….At least I will keep telling myself such things so I can enjoy! My daughter is a churro freak, we just got back from Mexico where she would eat 9 of those little guys in a sitting!! Yours look fantastic!! I love Churros but never tried making them at home.Yours look fantastic and that chocolate sauce is just the thing needed to take it to a new level 🙂 Its been a pleasure knowing you and cooking Sunday Suppers with you! You too Soni! I’ve loved connecting with you through Sunday Supper! Can’t wait to try these. The kids are going to love them! Just realized you’re not far from me. What a small world! That’s so cool! I love finding bloggers that are close by. Maybe we’ll have to set up a lunch date sometime–meet halfway? “Mini doesn’t have calories” Love it, that’s going to be my excuse from now on! Nothing and I mean nothing beats piping fresh hot churros. I am in total agreement. To be honest, I don’t think I’d ever had a piping hot churro before making them myself. Now I know what I’ve been missing all those years! Ooh! Churros!! I can’t remember the last time I had one! Can’t wait to try this recipe. You know, I don’t think I have ever had a churro… Looks like I have to add it to my foodie list this year! Pinning this for my sweet daughter who loves churros! Happy 2nd Anniversary too! I think churros are a delicious meal…breakfast, lunch and/or dinner works for me. I am fortunate to have several amazing restaurants near me that make churros but have never tried making them at home. 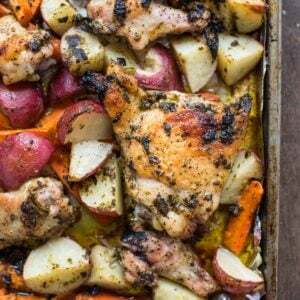 This recipe is so easy to do that I think I have to give it a shot! Mini things don’t have calories = truth as far as I’m concerned. So I can eat a whole bunch of these tasty churros and after plenty of dunking them in that chocolate sauce. We used to have a churros place in our mall… I miss it so much! Dang, Courtney, talk about celebrating #SS’s 2nd birthday in style! These churros look ridiculously good. I’d be ladling them out of the oil straight into my mouth, third degree burns be damned! I love this group too. It was what really gave my blog legs to stand on when I was just starting out. Fabulous post, girl, and I adore all of these gorgeous photos.